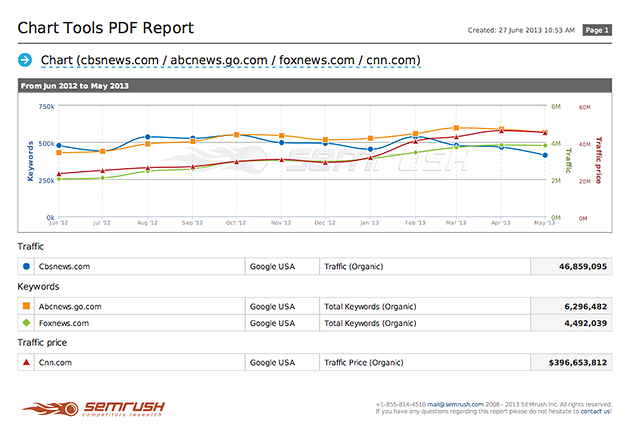 PDF Report option for the SEMRush Chart Tool and other new, interesting things to make your work even easier! We do hope that you already had a chance to tryout our improved Chart tool and that you can't possibly imagine your daily work without keeping it on your desktop or in your bookmarks. If you thought that was great, now you'll be plesently impressed with the new options available for our Chart Tool. Well, here we go! For your convenience, you now have the ability to see all values on the fly for all analyzed domains by your chosen criteria. Just hover a cursor over the chart and a window pops up with all the data for the time period of your choice. By clicking on any point on the chart you'll be directed to the corresponding report for this domain. Different types of charts are still available for use: line chart, bar chart (column chart), and pie chart. To make the Chart tool even much more handy, we added the ability to download the plotting chart as a PDF report. Just click on the "download report" button in the righthand corner. This option is available for absolutely all users. The new and improved Chart Tools can help you to work even more efficiently! So save yourself some time and try it out! SEMRush Tracking Tool Now even more intelligent! Meet the New, Fresh Backlinks Database!